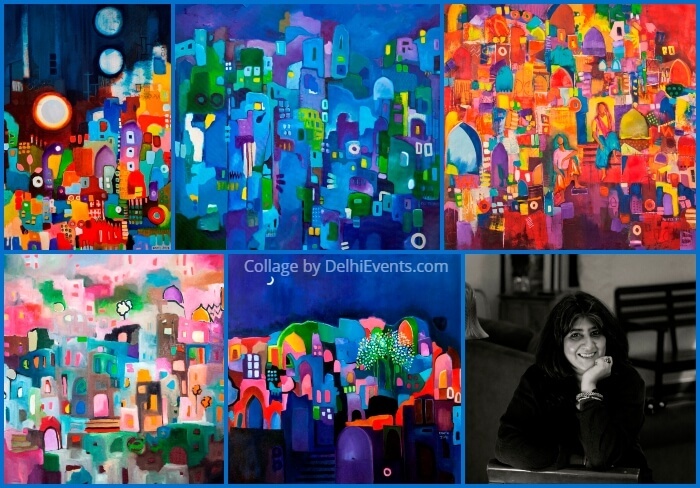 Event Description : ART EXHIBITION "Mohalla" solo show by Kavita Chopra Dikshit. In a world which is increasingly urban and alarmingly stressful and isolated, Kavita Chopra Dikshit’s new series of paintings is an abstract exploration of the concept of the Indian Mohalla – cramped spaces within which life unfolds in all its colour. It yearns for the romance of lost time, another world where community living was the order of the day. Neighbours were friends and it was a world of open doorways, and conversations over walls and rooftops, where the call of the local vendors competed with birdsong, where there were many little stories and nothing was a secret, where the days were slower and life in the closely knit community overflowed with a charm and exuberance that nostalgia made even sweeter. About the Artist : Kavita's art tells you a little bit about her. The realist who doesn't flinch in painting abandoned urban spaces and the poet who seeks beauty in that grime. She is the person who finds comfort in the ordinary, in the clothes drying on a line, in the familiarity of graffiti, while simultaneously at ease with the spiritual. Her abstracts are contemplative, the simplicity misleading until you notice the purpose in the brush strokes.